I am sooo fortunate to have been able to grow out my own hair. No sensation is as heavenly for me than to wear a pony tail in the summer and feel my hair brush against my bare back. I guess sensual would be the best descriptor. 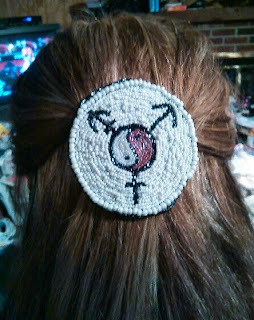 Of course I know, most transgender woman can't have their own long hair, for any number of reasons. "I have always envied girls and women who could wear their hair in a high pony tail. In my more athletic days, I could only imagine the feeling of a pony tail bouncing and swaying as I ran. Of course, the undoing of the band afterward, allowing the hair to fall with a shake of the head was just plain alluring. My reality is that I am limited athletically these days, and I have no hair anyway. All I can do is to have a few wigs with different styles, but a high pony tail just doesn't happen to be one of them. The feeling could never be the same, and the look would be so obviously "wiggy." Old Pix of my hair pulled back. I know when I wear my hair tied back, I do so love the guilty pleasure of "fooling" with my pony tail. I usually hope no one else has noticed! Plus there is a certain commercial on television now with a red headed woman wearing a high pony tail, I am so in love with. I hope someday I will get as good as when she effortlessly pulls hers' back! She is also driving a classic International Scout, all of which were made in my hometown. But Connie said it best! Thanks (as always) for your perspective.